Can’t believe I still have these handsome boys. This is Bloke he is out of Truffles. He is going to be a big boy, probably just over mini size, about 19inchs and around 50lbs. Piper and Wyatt’s puppies at 6 weeks. 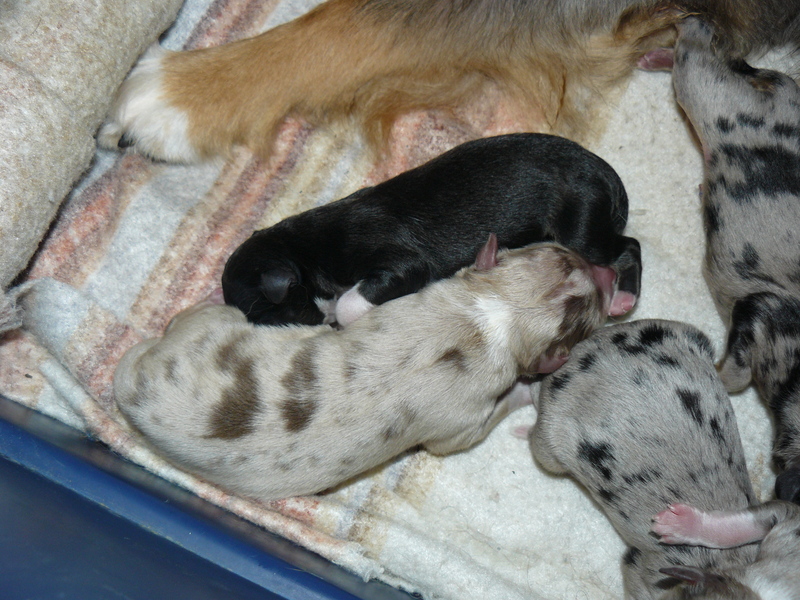 We had five happy healthy puppies born yesterday morning! Echo did a great job and is a wonderful mom! 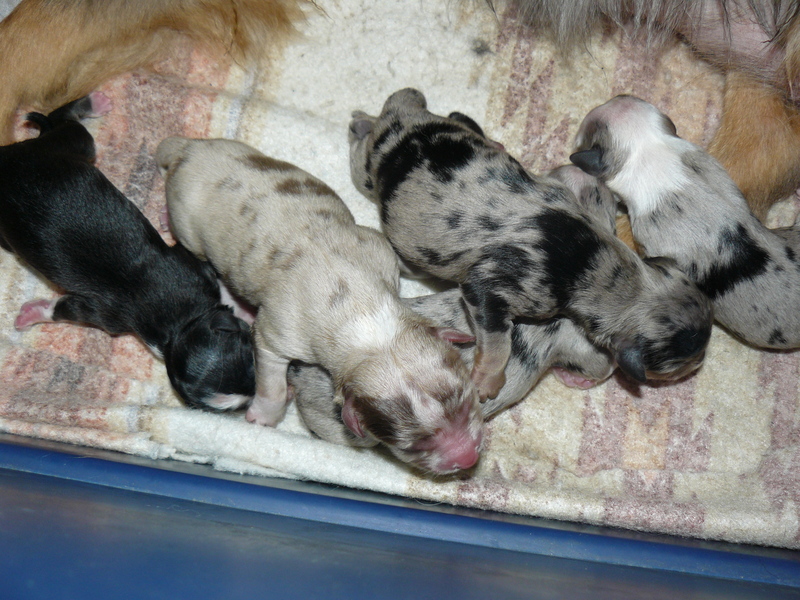 They are all girls except for one of the Red Merle’s is a boy. Here are some new pictures of Pipers beautiful puppies! I have decided to put Breeze up for sale, I love her to death but she is just too small for my breeding program. She 4 months old, my vet says she might make 15 lbs. Congrats to Susan she was first on the list, so all the rest of you Patently waiting new moms and dads, have just moved up one on the list! There is only one puppy left!! This puppy is now available. He can go home on Jan 11th. Piper s Puppies at 4 weeks old! playing, wrestling, growling and having a blast. Lacey and Wyatt’s pups at 3 weeks old. 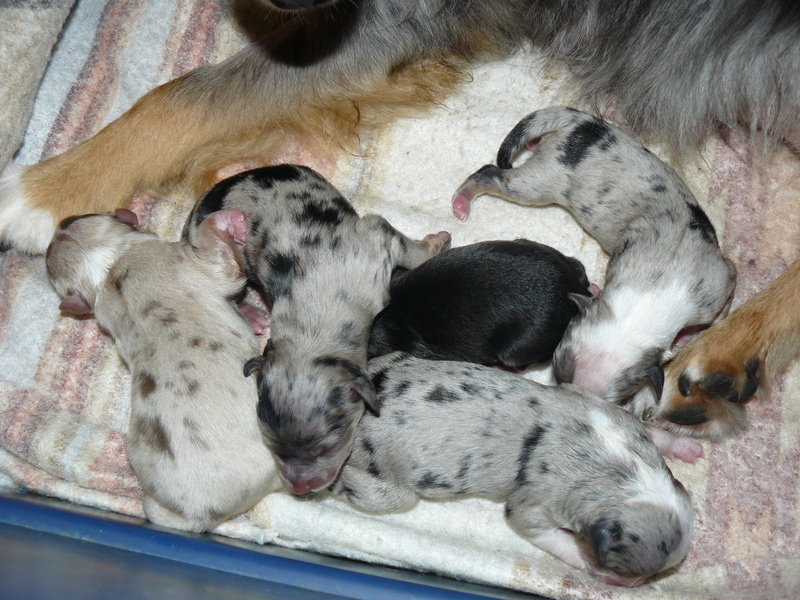 Lacy and Wyatt’s puppies are now 3 weeks old. What a lovely litter of beautiful babies. They are starting to get around on there own now, and just starting to play a little. There teeth are starting to come in. They are also just starting to becoming aware environment. Peeta is the only male he has a green background. Lacy and Wyatt’s pups at a week and 1/2 old. What beautiful babies. I used The Hunger Games as a theme to give them nicknames. Lacey and Wyatt’s babies are here!! I took Lacey to the vet today for her check up, and the vet checked her and said she ready. Her c-section was started at 2pm all went well I got to stay and help and watch them be brought in to the world. Five healthy babies. 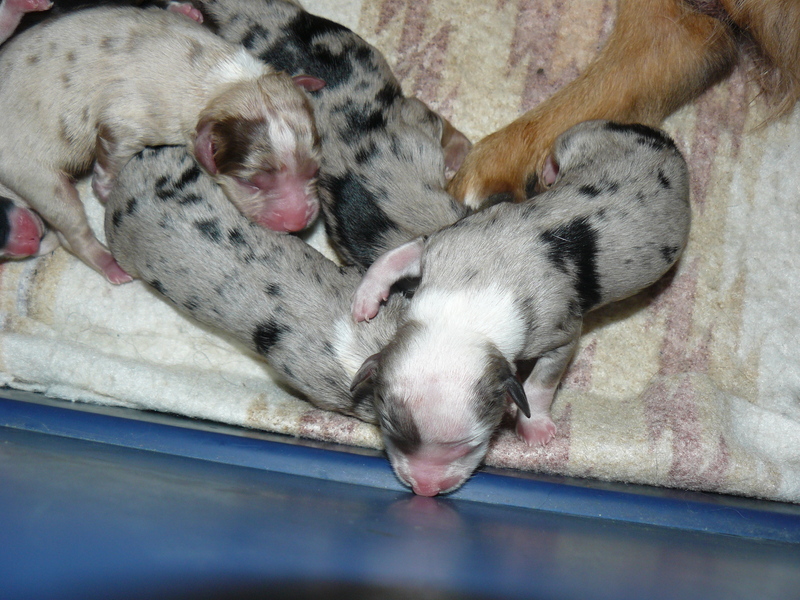 Only one boy, he is the Blue Merle with all the white. Piper and Eli’s puppies at 26 Days. They are both getting quite round! It won’t be long now! ( 8 to 14 days)!!!!!! Should be lots of reds from Spice and Wyatt’s litter! I am thinking maybe 12 pups in total…….Does anyone want to make a guess???? Who will make the right guess????? The hubby is thinking 10 pups, but I think he is way off!! !